Best Hammock Tents: Designed to Fit Your Adventures! After finding a perfect place to sleep in, it is the right time to set up your best hammock tent and finally sleep comfortably, like on a cloud! Hammock Tents are becoming very popular, crafted by many companies such as Eagles Nest Outfitters, Tentsile and Clark Jungle Hammock. Everyone found themselves outside and fighting mosquitoes while trying to fall asleep, many of us struggle to even fall asleep outside because it can be so uncomfortable and messy, but with these hammock tents, your problems can be solved right now! What are your needs and which of the hammocks can fulfill your needs the best? Remember to take a look at the dimensions and the weight capacity. In this article, we are going to discuss the best hammock tents, and give you several reviews for your consideration! Let’s first begin with some of the features you should look out for when it comes to buying a hammock tent! What are the few things you should look at when picking a hammock, and what is their purpose? Once you have your hammock, you need to figure out how to attach it to the trees. These simply swing around the tree, thread through themselves, and attach to the hammock. Being that they’re wider than rope, they will do less damage to the tree. Another option is to get tree straps and the Whoopieslings. This is a light-weight method and possibly much cheaper. Tarps are good because of the weather conditions. These come in all the shapes, sizes, and fabrics. This all leads to different weights. Symmetrical tarps are usually diamond-shaped and line up. 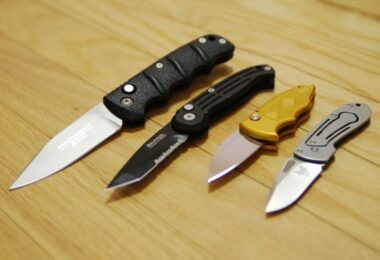 More protection, and heavier. Structural ridgelines can tied just inside the hammock suspension, and they will run across the hammock. These tie the suspensions to each other, and allow your hammock to have sag. 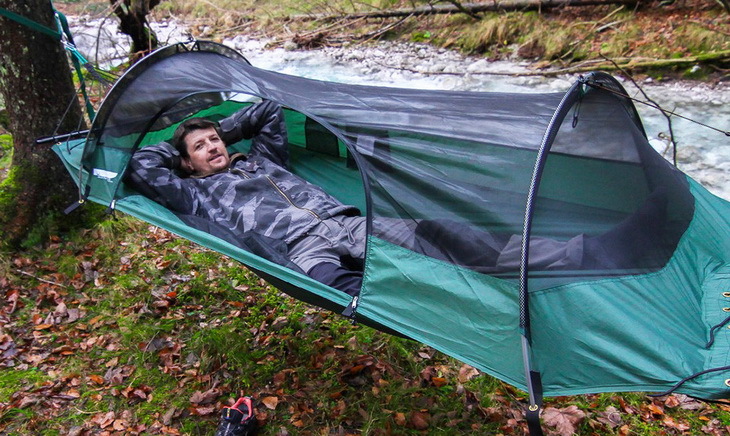 The greater sag allowing you to stretch diagonally in your hammock, allowing you to lie flat. Non-structural ridgelines can be tied to the tree lower than your suspension lines, and they are rather often for your tarp and/or bugnet. After figuring out what are the suspensions, ridgelines and tarps, you can probably have a clear image in your head of what you want and need. Go ahead, read and pick the best hammock for yourself, you deserve it! You will now see the top product reviews for the best hammock tents on the market! Description: Sleep carefree while protected from all the annoying mosquitoes with the navy / forest Skeeter Hammock by Grand Trunk. 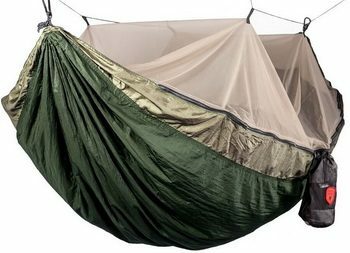 Weight capacity of 400 lb, mildew resistant parachute nylon, triple stitched, hammock has a suspended no-see-um mesh canopy to keep the insects far away from you. Double sided zippers make it easy to exit and enter the hammock. The Skeeter Beeter comes fully ready to hang with a suspension kit for the mesh, nautical grade carabiners and a rope kit.Camping in cold weather conditions where mosquitoes aren’t a factor? Simply hang the hammock with the net side down for an amazing view of the stars as you fall asleep. The hammock folds into its attached sack for super easy transport. According to many people who own the Grand Trunk Skeeter Beeter Pro – this hammock is very nicely designed and has provided many people with a good rest. Related: The Pawleys Island Tree Straps are heavy duty and made to be weather resistant. They come in a 2 pack as well. 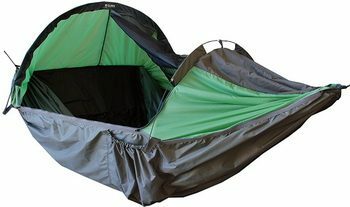 Description: Made in the States, from the good old USA fabrics; The Clark Outdoor NX-270 is a hammock that is suited for all 4 seasons and this tent is actually one of the most versatile models ever built. You are expecting tropical conditions or six feet of snow? The NX-270 will serve you surprisingly well either way. Every NX-270 comes with a combination of features/options you’ll find pretty much nowhere else: the breathable Weather Shield layer zips and goes all over the No-See-Um mosquito netting to transform the hammock into a closed tent with the warmth provided, a wind break, or extra protection from snow and rain. The insulating pocket system keeps you very warm in cold weather, removing the need for insulating pads on warmer camps. These pockets are easily accessible by the zippers on the inside of the hammock. Everyone struggles with a lack of storage, the NX-270’s insulating pockets will double the storage space for your gear. These six pockets are located right underneath the hammock where you can easily store your jackets and all your other gear during the night or during the day. There are two more pockets located inside the hammock, awesome for storing anything from a knife to a flashlight. The NX-270’s ropes are water-resistant polypropylene. Related: The ENO Atlas Hammock Suspension System is about $30 and can support up to 400 pounds. They are easy to use and set up quickly, with each strap being 9 feet long. Description: Who says you need to sleep alone?! This patented Clark Vertex Hammock is the only lightweight camping hammock that allows two people to sleep very comfortably without any disturbance. The hammock is just as stable as Clark’s other hammocks, so don’t worry at all, if one person gets in or out. In fact, you probably won’t even notice if the other one exits and returns back to the hammock during the night. The center storage section of the Vertex has more than enough space for two backpacks, or even a child (a small child). Two pockets attached to the center storage part can easily hold all the items you might need during the night. The two pockets can become one huge pocket in no time, if you prefer to put a larger item such as a backpack inside. With such great features, it is no wonder that those who have this hammock, feel comfortable as they can sleep next to their partner comfortably. Related: Stay dry with the Clark B01MU6 Tarp, as it is waterproof and has Velcro closures on the ends, and will last through thunderstorms! Specific features: Adjustable and detachable rain fly, support ropes, attached mosquito netting and stuff sack with set up instructions on back. Description: Side entrance zipper shutting with such heavy duty, 10-zipper and two double sliders. 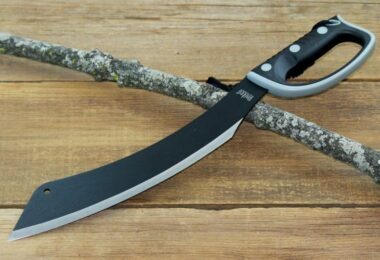 This is the most popular Hennessy Hammock Expedition model with patented features and options to actually show that you care about the nature. Including mesh pocket on webbing and ridgeline straps to protect the beautiful bark of the trees. No-see-um mesh provides amazing insect protection and will deflect wind to provide a safe and calm space inside. Hammock folds into an open-air chair or can be used on the ground as a tent if placed with your poles for hiking. New 70D catenary cut rain fly to reduce wrinkles and weight. This is an all-purpose hammock – great for family camping, expeditions, backpacking, kayaking, and any other purpose which requires durability and comfort for a reasonable price. This hammock comes in a grey color and is made for all purpose use, which is great for the outdoor adventurer! Related: The Hennessy Hammock SnakeSkins is a stuff sack that will let you pack up your hammock in no time! Under $20, this products is made from Silnyon. 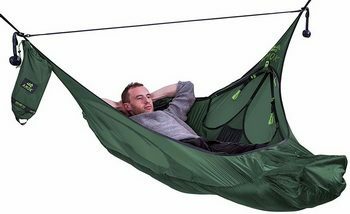 Description: A revolutionary hammock design that finally allows you to sleep in a horizontal position. The Ergo Combi Hammock is a comfortable, ergonomic, versatile and complete shelter system that feels like a true home in all weather conditions and environments. Generously sized, adjustable sun and rain roof. Full bug protection (100%) with a distance holding mat compartment and adjustable zipper closure mosquito netting. Tree Friendly Suspension Ropes: Webbing tree guard going all around the tree without damage Tarp guidelines is packed in the cord stuff sacks. Special rain shields to prevent water or the rain from getting into the hammock. Two color interior pockets for personal items like books and glasses. Buckle at the head end allows you to change the angle for your personal comfort. Zippers on both sides for you to easily handle the dry leaves. Users like it because of the horizontal sleeping position, the complete shelter and the pockets for storage! Related: The ALPS OutdoorZ Flannel Sleeping Bag will keep you warm down to negative 10 degrees with its 2 layer construction. It also comes with a stuff sack! Description: Both the extra waterproof layer and the mosquito net are easily removed, making DD SuperLight Jungle Hammock very customizable and truly versatile hammock model. Suits a wide range of activities and weather conditions. Recommended for tropical or rain forest expeditions. Add the curved spreader poles and the Jungle Hammock will become incredibly spacious. advanced Whoopie Suspension System, knot-free way to set up the height of your hammock. Bring the hammock with you whenever you are mountain biking, to minimize carrying weight. Or, if you don’t have an adventure planned, start planning because this hammock is truly amazing. 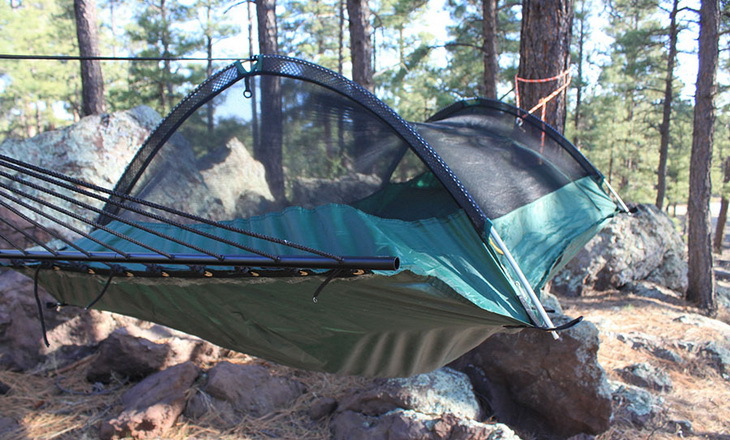 Users like this hammock because of the weather protection, easy set up, and light weight. Overall, it is comfortable and great for rainy weather, if you do not have a tent to sleep in. The Weather Shield works really well and that will help you sleep better, knowing you will stay dry as well as comfortable! Related: The Wet Weather Military Blanket is about $60 and has zippers. Plus it is made of nylon and is built to last. Specific features: Entirely flat sleeping position, plug and play suspension system included, chair function, a pocket for your personal belongings, integrated bug net, bottle holder. Description: Amok Draumr 3 Hammock is a extremely rich with features camping hammock made of 70D Ripstop Nylon. Sleep comfortably on your belly, side and back. An awesomely designed tarp made of 30D Double Silicone Coated Ripstop Nylon will keep you dry at all times, literally. The hammock can be adjusted and setup from a fully flat position, up to various levels and finally to a very comfortable sitting position. This way you can drink your coffee, read, or enjoy a beer more easily from the inside of your hammock, safely! For the wet weather conditions, a waterproof tarp accessory will fully secure over the top using a system of guidelines. Users like that this hammock is light in weight, comes with a tarp, and offers a flat sleeping position. There is also a pocket for storage and well as a spot for your beverage! While a little pricey, this hammock is loved by users. Related: The KingCamp Folding Chair is great for camping and outdoor relaxation. Under $30, this chair is a nice blue color, and has a beverage holder. It’s for the people who are always and will be always on the move, who need to set up fast and go. 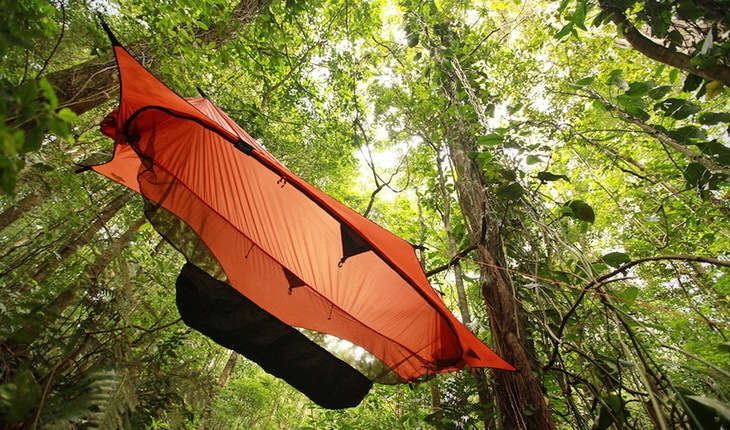 It can be used either as a tent hammock or depending on your needs – on the ground as a bivy tent. Blue Ridge Camping Hammocks are made fully of the finest materials, including a no-see-um netting, rip-stop nylon rain fly, and a very comfortable nylon pack cloth bed. Blue Ridge Camping Hammocks are extremely safe, very comfortable, easy to set up, and really protect all the occupants from all the flying insects and pretty much all the weather conditions. Waterproof nylon border on the canopy protects against water and wind blowing up under tarp, two very well designed interior storage pockets inside hammock, Nylon rope, O-ring in ceiling so you can hang the light. Related: The HangTime Superstrap is very strong and will not stretch. The straps are made of polyester and can carry up to 400 lbs. All of these Hammocks listed serve their purpose well enough, you just have to pick the one which suits you the best and start up the adventure! Each of these hammocks will surely keep you dry and bug free at pretty much all weather conditions you could possibly imagine, rain or sun, you will be protected and comfortable sleeping in them. Remember, picking the right spot is also very important, you don’t want to fall down in the middle of your sleep right onto the wet ground and dirt. Before picking the right hammock, make sure you read all of the dimensions and descriptions, because they are all different and serve you on a different kind of way, depending what you look for. According to many people who have tried these hammocks listed above, these are very comfortable, versatile and easily packed, allowing you to move and change your sleeping place whenever you wish. We hope that you found our article useful and that it helped you in finding the right hammock for your needs. Do you think we missed any of the great products out there? If so, please let us know in the comments.